Chip-maker Intel has revealed a collision-avoiding drone that automatically dodges obstacles in its path. The device was demoed at the CES tech show where it autonomously detected and avoided a fallen object. Intel part-owns Yuneec, the company behind the drone, and provided the device’s 3D camera sensor. The RealSense technology involved uses infrared lasers to detect the distance of nearby things. Should evasive action be necessary, the aircraft takes it on its own. At CES, the Typhoon H drone followed a cyclist through a small course on stage, complete with a handful of mock “trees”. When one of these obstacles was made to fall in the drone’s path, it dodged it, and thereby avoided a collision. 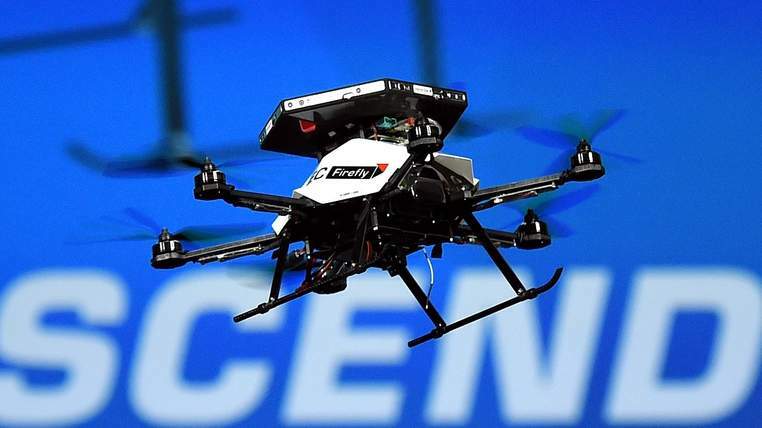 “The drone was able to stop, wait and go round that obstacle as well – following the rider all the time,” said Intel’s chief executive Brian Krzanich. The Typhoon H also has a 4K camera which has can pan 360-degrees and take photographs with a 12 megapixel sensor. Intel said it would be on sale within six months. It is set to cost $1,799 (£1,200). Features such as collision avoidance are not likely to prevent the kind of tumbles which nearly caught skier Marcel Hirsher last month, commented IHS analyst Tom Morrod, when a drone malfunctioned. “There’s a safety aspect which is probably not going to go away – things that fly occasionally crash,” he said. However, he added, the benefits of more intelligent drones are not to be underestimated. “Things like collision avoidance, self navigation, spatial awareness – all of these technologies that take away the manual control of the drones are enabling drones for commercial purposes,” he said. Another safety conscious drone at CES comes in the form of Belgian firm Fleye’s device. It encloses its spinning blades within both a shell and a cage to help reduce the risk of injury. However, as a demo for the Vienna Times proved, it is still possible for the device to swerve off-course and crash. Parrot announced another new drone – one capable of flying much further and faster than helicopter-inspired devices, thanks to a fixed wing design. The Disco drone can fly for up to 45 minutes and follow a pre-planned flight path via GPS waypoints. Its on-board camera is embedded into the drone’s nose and captures video in 1080p high definition. Parrot hopes to make the device available later in 2016. “This ‘drone on steroid’ speaks to the innovation in this wave of consumer drones,” said Daniel Ives, an analyst at FBR Research.